Lamborghini was a tractor maker, so he wanted a much more practical car. For the production version, he commissioned Carrozzeria Touring to redesign the body, while the engine got detuned from 347 horsepower to a more sensible 274. 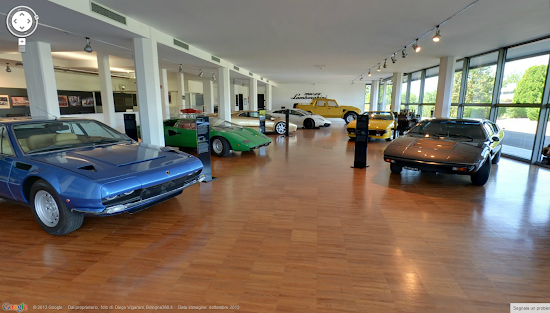 The great people behind Google Street View took a break from Doctor Who easter eggs and went to Sant'Agata Bolognese to record an indoor view of the Lamborghini Museum. The best thing? You can sit in/look around the Miura SV, the Countach LP400, the LM002, the Diablo race car, the Reventon and the Sesto Elemento. The Lamborghini Museum is a wonderful display spread across two floors full where you find Miuras, Countaches, Diablos and Murciélagos accompanied by rare prototypes, limited editions, one-offs, racing cars and marine engines. Unique scale models of original styling can also be found on display along with some of the legendary V12s.